Qi Baishi (1863-1957) is one of the most renowned artists of 20th century China. A native of Xiangtan, Hunan province, he was an apprentice to a carpenter in his early years and later became a professional painter. He finally settled in Beijing in 1920, where he was strongly influenced by scholar painters, notably Chen Hengke (1876-1923). It was in Beijing and developed his mature, vigorous style. 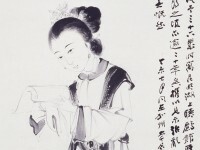 Qi is famous for plant paintings featuring strong contrast of black ink and vibrant red, and for his vivid ink depictions of shrimps, frogs, and insects. The inscription reads ‘It is easier to plant than to paint trees. I spent my whole life in painting until my hair turned white and my eyes blind. Would anyone appreciate the mountains after rain under my brush? Baishi at eighty-nine, painted and inscribed with an old poem.’ Qi Baishi and Michael Sullivan (1916-2013) never met. The paintings by Qi Baishi in Michael’s collection are mostly bequeathed by Geoffrey Hedley (died 1958). This painting, however, is an exception. It was a gift from two noted translators, Yang Xianyi (1915-2009) and his wife Gladys (1919-1999). Yang Xianyi and Gladys met at Oxford in the 1930s, when Xianyi was studying classics at Merton College and Glady was studying Chinese. The couple returned to China in 1940 and began introducing Chinese classics to the English-speaking world. Michael met and became friends with the couple in 1940s in west Guiyang, Guizhou province, when he was working for the International Red Cross. During the Cultural Revolution, both Yang and Gladys were arrested and held for four years. 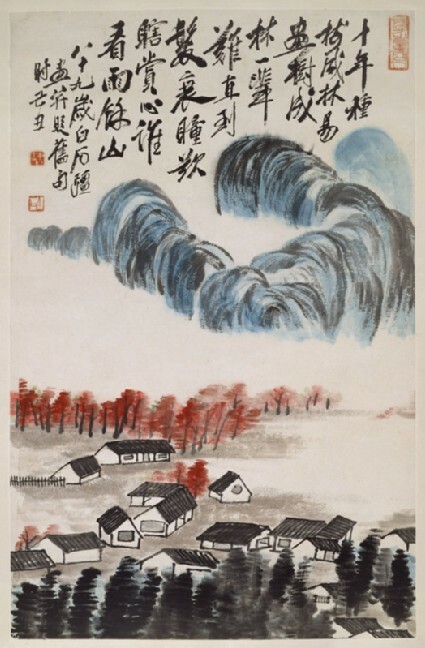 When Khoan (1919-2003) and Michael visited the couple in Beijing in 1973 after their release, Yang opened a cupboard that had been sealed during their incarceration , selected this fine painting and gave it to them.